Life on the Earth is an endless Carbon cycle that depends on energy. Energy is essential for economic and social development of the world. 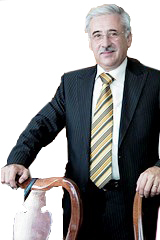 The environmental challenge of energy use, production and consumption becomes very important in everyday life. We must explore and take care of all aspects of energy production and consumption, including energy efficiency, clean energy, the global carbon cycle, carbon sources and biomass, as well as their relationship with the climate and natural resource issues. Nearly 200 years ago the world began consuming fossil fuels and has depended on them to a major extent over time. There are concerns that emissions from fossil fuels lead to changing climate with disastrous consequences. Over the past five decades, the world’s collective greenhouse gas emissions have increased significantly. In order to avoid a climate catastrophe, the first priority of the world environmental policy is to act now and in the near future, in order to reduce the CO2 emissions and maximize the use of alternative energy solutions. All technologies based on alternative energy are not equal; all of them have various advantages as well as inherent risks and drawbacks. When evaluating the energy options, one should consider all aspects, such as performance against known criteria, basic economics and benefits, efficiency, processing and utilization requirements, infrastructure requirements, subsidies and credits, waste and the ecosystem, as well as unintended consequences such as, impact on the environment and natural resources. The ‘’clean energy” future will be a composition of technologies based on renewable energy sources such as solar, wind, water and biomass, which play an increasingly important role in the new global energy economy. Solar energy is unique between all energy sources mentioned above since it can easily provide heat or electricity. Solar energy is referred to as renewable and/or sustainable energy because it will be available as long as the Sun continues to shine and survive. The calculations show that the Sun will continue for another 4 to 5 billion years. Sunlight is by far the largest carbon-free energy source on the planet. More energy from sunlight strikes the Earth in 1 hour (4.3 × 1020 J) than all other energy consumed on the planet per year (4.1 × 1020 J). All the known Earth reserves of coal, oil, natural gas, and uranium combined are more than 10 times smaller than the energy received from sunlight each year. Renewable energy has been given very low priority by most of the political and business leaders.Energy solutions for the future depend on local, national, and world policies. Solutions also depend on individual choices and the policies that we implement as a society. Our philosophy is very simple: The target of our solar thermal collectors ‘is’ to have the highest coefficient of efficiency and maximum produced energy /m2 /type of collector and consequently the cheapest produced energy (KWh/m2 of collector). The core of the solar thermal collectors are the absorbers where the solar radiation is transformed to heat. 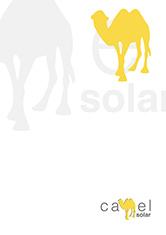 Camel Solar use the best absorbers available produced with new and innovative technology and construction. Transformation of Solar radiation to heat with maximum absorption and minimum emission of the solar radiation is one of the key factors for high coefficient of efficiency of the absorber. Our R&D sector together with our partner Plasma R&D Center for solar energy and surface engineering continually work on increasing the Coefficient of efficiency of the collector with, competitive market price. Innovations’ ,R&D , rationalization and the best appearance of the collector are the main and the most important activities of Camel Solar. We especially pay maximum attention to use our knowledge, experience and innovations to produce the best façade collector with the best absorber. Our absorbers do not show welding lines and waves or deformation making them totally different from all other existing ultrasonically or laser welded absorbers where it is possible to see lines, spots and waves. Our absorbers assembled in façade collectors, use the best solar Iron free tempered glasses with antireflection and low soiling coatings, compact enclosures and frames with the application of these leading edge technologies we are able to produce the best collectors available in the world. The evacuated tube collectors are produced with our innovative and patented the high-efficiency heat transferred absorbers. If the investors spend a lot of money to build buildings, offices, houses, then solar thermal collectors must be decorative part of them and implemented in architecture. The solar panels can be used not only on roofs but also facades, balconies of buildings for solar energy application. Our goal is to achieve the application of solar thermal collector technology linked with architectural compatibility to achieve high performance along with attractive appearance. Many applications including solar cooling and industrial applications along with sanitary water and space heating often need higher temperatures and camel solar collectors are the best choice in these applications.